The northern end of Mound AB, shown here from the North, comprises more than 17 meters of occupational debris beginning on top of an old levee of the river Ravi and continuing up from the Ravi [Aspect of the Hakra] phase (Period 1 from before 3300 to ca. 2800 BC) through the Kot Diji phase (Period 2, ca. 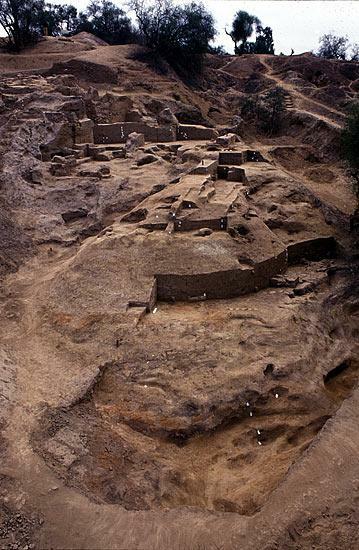 2800-2600 BC), the Harappa phase (Period 3, ca. 2600-1900 BC), and the Harappa/Late Harappa phase Transitional (Period IV, ca. 1900-1800 BC) to the Late Harappa phase (Period 5, ca. 1800 BC and later). The early Ravi phase materials shown in the following slides come from deposits below the horizontal red and white meter scale.